Erik Thorvaldsson was born around 950 A.D. in Norway. 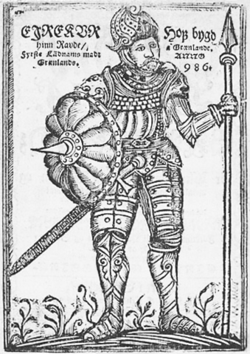 Erik was the son of Thorvald Asvaldsson, but is better known as Erik the Red, probably due to his red hair. Thorvald was exiled from Norway for committing manslaughter, so he and his family, including Erik, moved to Iceland. Erik, after marrying a woman named Thjodhild, moved to the island of Oxney. After finishing his house, he went back to a man named Thorgest to retrieve some, setstokkr, or items of mystical importance that he had given Thorgest to keep safe. When Erik wasn't given his setstokkr, he took some from Thorgest's house, though it is unknown whether they were Thorgest's or Erik's. When Thorgest followed Erik, two of Thorgest's sons were killed by Erik along with several others. Erik was thus exiled from Iceland for three years. Erik then moved west, and is one person credited with discovering Greenland, though he was definitely the first person to settle there. Greenland got its name from Erik. The whole name was part of an advertisement scheme to draw people to Greenland even though it was very cold and icy there. Erik created the settlement of Eystribyggo in Greenland where the settlement grew to the size of 5,000 with Erik as their leader. Erik the Red died around the year 1003 A.D. He is important for discovering Greenland, creating one of the largest advertisement lies in history, and for having the son, Leif Erikson, who would later be one of the many discoverers of America.